Past Junior Grand Deacon, United Grand Lodge of England. A peculiar system of morality, veiled in allegory and illustrated by symbols. This is the answer to the question, ‘What is Freemasonry?’ I maintain that, by giving such a shorthand answer, we may be short-changing ourselves. This is, and is intended to be, a quick answer which endeavours to describe that which, in fact, cannot be described in words of one syllable, indeed may not be described adequately in words at all. The central word of that phrase is ‘allegory’, and therein lies the clue: we may not name, in words, that which is only describable by allusion, inference, hints, signposts, codes. The name may not necessarily impart the essence. If you point to a picture of a tiger and say to a child ‘tiger’, for that child, who has never seen a real tiger, the picture itself assumes the name ‘tiger’, and the real animal will then need another name entirely to identify it. The picture does not communicate the essence of the animal. 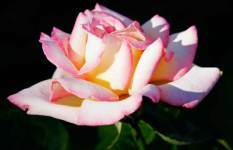 To take another example: asking someone to describe the delicate colour of a flower has similar dangers: to me it may be pink; to another it may be golden yellow; but in fact that colour may be unique to that flower, and may have no name at all. Umberto Ecco maintained that the name of the rose was not its essence: that to name it, was to become immersed in the name, which diverts us from experiencing its peculiar beauty, its colour, its scent, the texture of its petals. ‘Oh yes, I have a lot of roses in my garden,’ you may tell me. But that doesn’t tell me anything about them. I have to go to your garden and experience for myself what you have done your best to describe, but which still leaves me wanting to know more. Ecco went so far as to say that naming something destroys it. No. The essence of Freemasonry may not be put into words. We are not dealing in facts. We can however get a little further by asking, not ‘What is Freemasonry?’ but ‘What does Freemasonry do?’. In its little square booklet Freemasonry: An Approach to Life, the United Grand Lodge of England asks the question ‘What is Freemasonry?’ but then, curiously, it does not tell us what it is, but rather what it does. in other words, by first coming to understand, and to know, ourselves, in order afterwards to attain moral lessons. Are we here on more secure ground? Well, I think we are. ‘Freemasonry provides a path to be followed in progressing towards our own centre, to discover the mystery which is our Self, the beauty in our Self, and the mystery of the spark of divinity within us’. Now we are talking about mysteries, those glories which can be imparted by decoding the allegories. 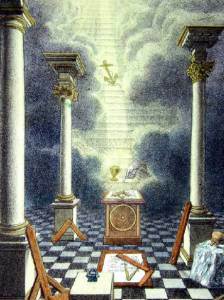 What is more, in dealing with the mystery of Freemasonry, we are engaged in the pursuit of the oldest western mystery tradition of all. ‘In all regular, well-formed, constituted lodges, there is a point within a circle round which the Brethren cannot err; this circle is bounded between north and south by two grand parallel lines, one representing Moses, and the other King Solomon. 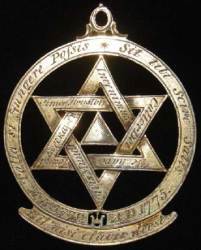 On the upper part of this circle rests the Volume of the Sacred Law, supporting Jacob’s ladder, the top of which reaches to the heavens’ . . . and it goes on . . . ‘In going round this circle, we must necessarily touch on both those parallel lines, likewise on the Sacred Volume, and while a mason keeps himself thus circumscribed, he cannot err’. This is a fairly direct injunction. What injunction? Well, in the midst of allegory, I must not be dogmatic. So I will say ‘It seems to tell us that’ this symbol points to the need to be self-aware, self-knowing, to know our own centre. Here we should be careful to distinguish between self-centredness, a scenario in which we are bound up in being interested in ourself to the exclusion of those around us, and self-awareness, a scenario in which we first seek to be aware of, and to know, our own nature, virtues and vices, after which we can then be secure enough in ourselves to relate to those around us. A self-centred person may indeed be seeking self-knowledge, but may not have progressed beyond an empty feeling of self-inadequacy. So: we enter the temple at our initiation blindfolded. I think we all know why this is, but let me crave your indulgence to expand on it a little. We begin our life in the darkness of the womb. We end it in the darkness of the tomb. Between those two extremities, light is essential to our progress, in a literal, physical sense as well as in a figurative, symbolic sense. Of all the organs of sense with which humans have been blessed, the eyes are the most perceptive. Deprived of light, we are more helpless than when deprived of any other sense. But deprived of spiritual light we can be yet more disabled. We may indeed have come to Freemasonry seeking spiritual progress because our own inner light, our own centre, was shining not as brightly as it might. When we set out on our masonic journey, we were told that we would be deprived of light, so that did not come as a surprise to us. But the reason for this deprivation only became clear once we were on our way. We were not to take notice of light from outside, nor indeed outside influences of any kind, so that we might better concentrate on what was happening inside, so that we might identify and appreciate the inner light. This was a light which was faint at first, growing stronger as we felt our spirit grow stronger. Vouchsafe Thine aid, Almighty Father and Supreme Governor of the universe to our present convention, and grant that this candidate for Freemasonry may so dedicate and devote his life to Thy service as to become a true and faithful Brother among us. Endue him with a competency of Thy divine wisdom that, assisted by the secrets of our masonic art, he may the better be enabled to unfold the beauties of true godliness, to the honour and glory of Thy holy name. By reciting the words of this prayer, the Master recognises that the aspirant is in need of initiation as a route away from his base self, rising to a fuller, brighter existence, a real moral and ethical advancement in himself, a journey towards God. He gives recognition to the fact that the aspirant is in need of wisdom, and which of us is not? But, and this is important, the words of this prayer conceal something of supreme importance for Freemasons. ‘ . . . that he may the better be enabled to unfold the beauties of true godliness . . .’ We have first to ask ourselves: how am I to unfold the promised godliness? Then we have to ask: and where is it situated? One explanation of this is as follows. I must ask you to fasten your seatbelts and hold on for a moment, because this is not the sort of talk we are used to in lodges of instruction. I want you to accept for a moment that we actually inhabit two universes at the same time. There is the physical, material, sensual world – a world with hard edges so to speak – and there are the limitless, eternal realms, not restricted by physical phenomena, and not available to ordinary perception, but which are still a part of our universe. Quests for an explanation of non-material phenomena have existed since the beginning of the human race. In the ancient world, these quests belonged to a body of thought known as the Mysteries. In these realms, the arenas for the exploits of the gods of mythology, events occurred which were governed by the same natural laws existing in our world of ordinary experience, and had an important influence on the daily activity of human life. To illustrate this, every time we dream, we are participants in supernatural events, since the boundary of the inaccessible part of that supernatural domain is the threshold of our own consciousness. The Mysteries were schools which provided the gateway to those realms, and the natural laws operating in them, and incorporated in the practice of the ancient Mysteries was a process of initiation directly comparable with masonic initiation. In those ancient times, from those realms where the writers of our ritual very probably took their inspiration, the Greek god Hermes formulated the idea ‘As above, so below’ as an induction into explaining the universe. The full saying is ‘That which is above is like that which is below, and that which is below is like that which is above, to achieve the wonders of the One’. This encapsulates the idea that the universe is the same as God; God is the same as man; man is the same as the cell; the cell is the same as the atom, and so on. To sum it up, this message theorises that man is the counterpart of God on earth, just as God is man’s counterpart in life eternal. 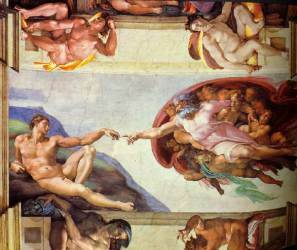 Therefore it is a statement of an ancient belief that man’s actions on earth mirror the actions of God in life eternal. We have a way of representing this in Freemasonry by two important symbols. The hexalpha is a six-pointed star formed by inverting one triangle over another and interlacing them, in such a way that one point is directed towards heaven, and the other towards earth, pointing out how man’s nature, the ‘below’, is inextricably that of God, the ‘above’. Jacob’s ladder (see the image on the right) similarly illustrates that earth and heaven are connected, with angels both ascending and descending on it. This is a long way of saying that, if man’s consciousness is brought to bear on his own nature, he may discover that element within himself which is divine. We often call our own or others’ gifts ‘God-given’, meaning that without divine aid, our own efforts are worthless. One of the psalms in the old testament says ‘Except the Lord build the house, they labour in vain that build it: except the Lord keep the city, the watchman waketh but in vain’. By our own heightened state of consciousness in the lodge, we may arrive at that state where our own nature approaches that of God, but if our endeavours are those of the rational mind alone, without divine intervention, they will be incomplete. We may be able to build better through self knowledge, that is, knowledge of a potential in ourselves that we may never have realised, a potential that reflects the divine spark which resides in each one of us. In the lodge of Entered Apprentices in which we were initiated, light was witheld only from us, not from the other members of the lodge, because the journey was ours alone, the journey away from the darkness of un-knowing to the light of knowledge of our Self. The other members of the lodge were there to help us on the journey, but they could not take part, since the journey was the journey towards knowledge of our Self, the journey towards our own centre. We may often think that we know ourselves, but this may be an illusion. If we regard ourselves in a mirror, do we believe that we see the true image, the true person as he or she is? Of course we do not. We see something very close to the real person, but we do not see ourselves as others see us, because the mirror has transposed our features – the left side has become the right, and vice versa. So it is clear that we will have to go deeper than skin deep to investigate the real self, with its virtues and vices, strengths and failings, smooth ashlar and rough ashlar. Our restoration to material light later, followed the question ‘Having been kept for a considerable time in a state of darkness, what is the predominant wish of your heart, your centre?’. The considerable time referred to here is not merely the time that has elapsed since we were admitted to the Temple – it refers to the time, perhaps since birth, that we have spent wishing for more light for our heart and for our spirit. It refers to the considerable time most of us spend in darkness, removed from spiritual riches, and therefore in true poverty. Let us proceed further along this allegorical highway. Part of the journey to the centre in the second degree is only mentioned in the third, and it is this. PROCEEDING ONWARDS, STILL GUIDING YOUR PROGRESS BY THE PRINCIPLES OF MORAL TRUTH, YOU WERE LED, IN THE SECOND DEGREE, TO CONTEMPLATE THE INTELLECTUAL FACULTY, AND TO TRACE IT, FROM ITS DEVELOPMENT, THROUGH THE PATHS OF HEAVENLY SCIENCE, EVEN TO THE THRONE OF GOD HIMSELF. THE SECRETS OF NATURE, AND THE PRINCIPLES OF INTELLECTUAL TRUTH, WERE THEN UNVEILED TO YOUR VIEW. Now, like all good allegories, this needs decoding. I would ask you to consider that the secrets of nature are the intricacies of our own nature, and the intellectual truth is our knowledge of that intricate nature, a knowledge based not on book-learning but on the intuition of the heart. 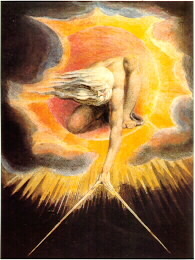 This would make perfect sense of our approach, in the second degree, to the middle chamber, that place where we come to know the name of God, where we can sense that we have come nearer to knowing the nature of God, and to identify, following the first degree prayer, that part of our Self which we call the divine spark, the goodness of our own spirit. IN THIS POSITION, WHAT HAVE YOU DISCOVERED? IN THE CENTRE OF THE BUILDING. TO WHOM DOES IT ALLUDE? THE GRAND GEOMETRICIAN OF THE UNIVERSE. The centre of the building can therefore be the physical temple in which we have been working; it can be the temple of humanity, in whose construction we are, hopefully, taking part; it can also be – it must also be – the centre of our own building, that space which we seek to investigate on our masonic journey, and in which we hope to discover ever more elements of divinity within ourselves. BY THE HELP OF GOD AND THE UNITED AID OF THE SQUARE AND COMPASSES. As we know, the square no longer predominates over the compasses. Both points are revealed – our material concerns no longer take precedence over our spiritual progress, and thus all three of the great lights will be accessible to us. But there are still more thresholds to come in this sublime degree. We pass the threshold of the grave, leaving our own mortal nature with all its transgressions behind. We pass the threshold of the communication of the five points of fellowship, a sublime lesson of how to lead our lives in relation to humankind and to our Brethren in particular. But of supreme importance, we pass from the middle chamber of the temple into the sanctum sanctorum, where the light of the blazing star floods in through the dormer, where we stand face to face with the Most High, and acknowledge our one-ness with Divinity, and discover, finally, that which we unfolded by the prayer in the first degree, namely your own centre, the spark of divinity within ourselves. In the sanctum sanctorum, where our base self is not buried, we come face to face with God. Aided by divine light and wisdom we have pierced the veil. We have lifted our eyes to God’s hope for us, the bright morning star. We have trodden evil underfoot. We are now listening to the voice of our own purified nature and are coming to know our own vital and immortal principle, namely that light and goodness of which we are all capable. And the third of the three Great Lights, the compasses, are given to us to work with. The compasses, we are told, define the limits of good and evil. By adhering to the centre, where the first leg of the compasses is placed, we adhere to the moral law. To stray over the limit set by the other leg of the compasses is to disregard the moral law, that code by which we live in harmony with our fellow-men. In the words of the first degree, while we keep ourselves thus circumscribed, we cannot err. We have all had the three degrees conferred on us. We may not have had all this in mind as we progressed, but we certainly can open our hearts to such insights now, in whatever form suits us best – it doesn’t have to be my way! And perhaps we can now, with such insight, impart something of this to those whom we, in our turn, initiate pass and raise, so that they in their turn, may find their own way to the centre.